Company Profile ZHONGSHAN DONGYU LIGHTING FACTORY is amanufacturer specialized in research & production &salesand service for all led holiday lighting products series . We are located in xiaolan town , with convenienttransportation access. Our aim is " quality first , credit frist ,customer first , aftersales service first ". Our company founded in 2009 ,we have many years of production experience , we have quality assurance 1 - 2 years . 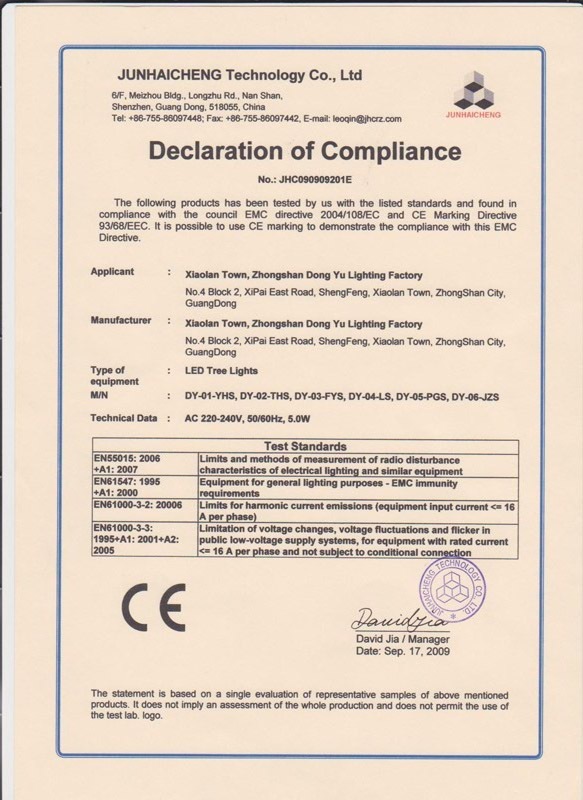 We have obtained CE , ROHS certificate ect .Our main products : LED TREE LIGHT : like cherry blossom , peach blossom , canada maple , weeping willow , twig tree , artificial tree , coconut tree etc ... LED ABS motif : 3D series like all kinds of animals , bears , santa claus , snowman , angle & 2D series like LED balls ,bells , eight star with different color of garland on the surface ...both for indoor and outdoor used . LED normal decorative light : like string light , curtain light ,waterfall light , icicle light , net light both in PVC cable .